Welcome and happy Saturday! 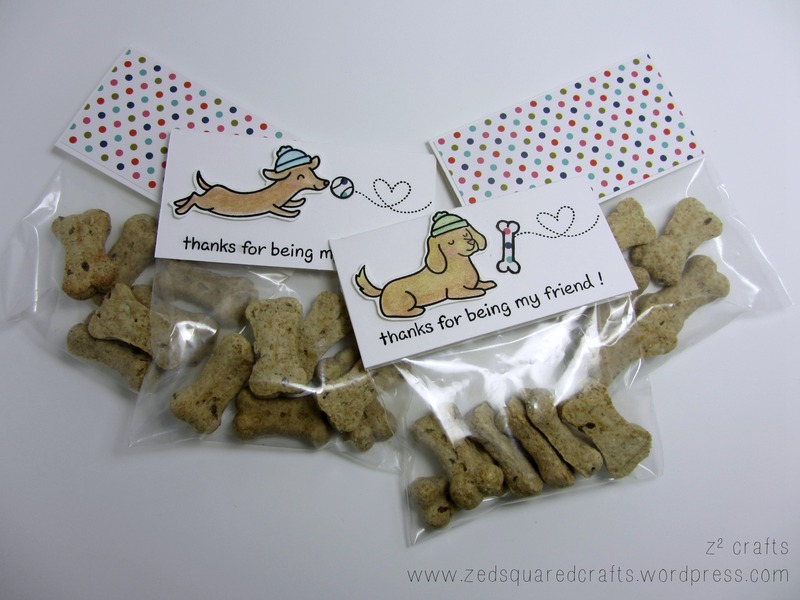 A few weeks ago I created some dog treat bags for the Scrapbooks by Design blog. If you missed that post, you can see it here. My new Lawn Fawn supplies recently arrived, so I decided to circle back and craft the bags again, this time for Easter with chocolate treats for humans. 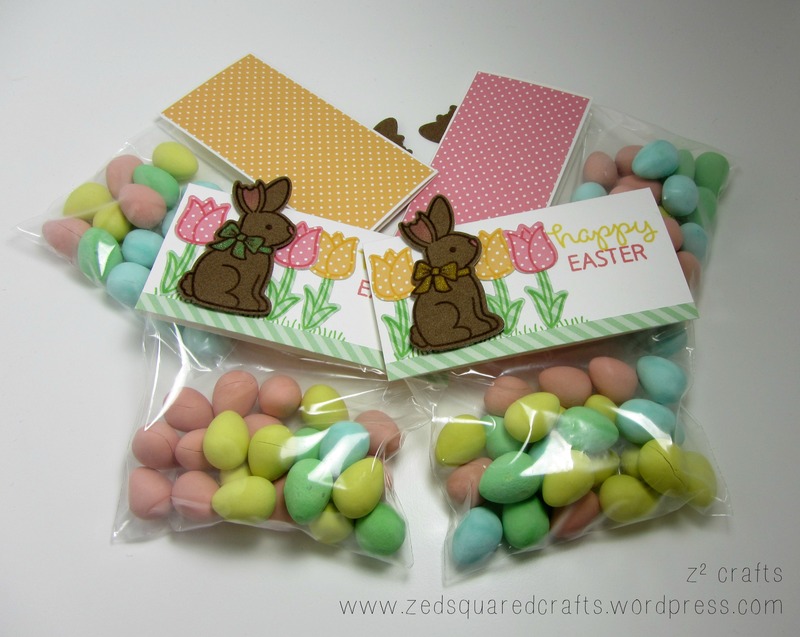 One thing that I knew I wanted to incorporate on the labels, were fuzzy Easter bunnies. I even ordered some faux suede with this idea in mind! The Lawn Fawn, Eggstra Special Easter, stamp set comes with two adorable bunny images so I was all set. If you want to skip ahead, there is a video tutorial, below, showing how I made the treat bag tags. Before I started my project, I played around with my faux suede and discovered that I could stamp, colour, and die cut it as if it were cardstock. WOOT! The faux suede that I used is from EK Tools. It came in a pack with 18 sheets in a variety of neutral colours. It’s not a perfect match for the texture of suede, but it’s pretty close. One note to also keep in mind, is that the white sheets are more of a cream colour. I think that the faux suede is probably easier to use than felt, as the fibres are shorter. The shorter fibres is likely why I was able to stamp, cut, and colour it so easily. Another neat feature of these sheets is that they have a paper backing on them so you can easily use your standard adhesives and tapes. I found that the best ink for stamping onto this material was a dye ink. Pigment inks tended not to dry (even with a blast from my heat tool) so they smudged quite easily. I stamped my images onto the suede using the new Lawn Fawn inks and then gave them a good zap with the heat tool. This heat step seemed important since when I just let it dry without the heat, the ink still smudged a little. I tested all the colours and none of them were affected by the heat. I also experimented with colouring on the faux suede material. While alcohol markers did work, I was a little worried about damaging the marker nibs on the fabric. More importantly, I found the marker’s ink really seeped into the suede and had a saturated (dark) look. I found the best way to get vivid colours was with my Prismacolor Pencils. I used a light hand when applying the colour to make sure that I didn’t change the texture of the suede. That’s it for today! I hope you found this info helpful and that it’s inspired you to play around with unusual mediums and speciality media. Welcome! This week the Colour Me challenge incorporates four(!) colours: two shades of red, a teal, and a turqoise. When my card has to be extra (eggstra…) colourful, I tend to use each colour quite sparingly. This card is no exception. I combined several patterned papers to paper piece and create an Easter themed shaker. Since the four colours are similar in tone, I was able to find plenty of paper in my stash that fit the bill. Almost all of the supplies I used were from Lawn Fawn. Make sure to check out my video tutorial to see how I made this week’s card. Thanks so much for dropping by this week! Hope to see you back here again soon! Welcome! This week the Colour Me…! challenge kind of stumped me until I went back home to Ottawa to visit my family and was given some new crafting goodies as a belated birthday gift. The stamps inspired me immediately, so the moment I got home, I got to work. This week the challenge is to create a project using blue, yellow, and beige. I usually start a card with a quick sketch, but in this case just let my mojo flow. Along with the Typewriter stamp set, I picked out supplies that worked with the colour pallete and got to work. Welcome! Today is March the lucky 13th. I am thrilled to be joining the Scrapbooks by Design blog! I’m going to jump right in to today’s tutorial: creating dog treat bags and stretching your stamps with Lawn Fawn. As a newer stamper, I need to get the most from all of my stamps because I don’t have a huge selection in my stash. For my treat bags, I used Lawn Fawn stamps, and stamped the hat from one image (Winter Sparrows) onto two different dog images from Critters at the Dog Park. There are several ways I could have added the hats to the dogs, but I wanted to create a single one-layer image, so I used a masking technique. I found the 4×4″ bags at my local dollar store. You can use any bag you have (even a standard Ziploc bag) and just adjust the tag measurements. For this project, my tags were cut to 4×4″ and scored at 2″ to create the fold. Never wanting to leave anyone out, these little treat bags will be perfect to spoil furry friends when I visit my human friends and family. I think it would be fun to recreate these bags again for different occasions and combine different stamp sets using the same technique. For instance, the costumes from Critters in Costume would be adorable on tons of images. You could also easily swap the dog snacks for human snacks and create gorgeous hostess gifts, or even party loot bags. Thanks so much to Scrapbooks by Design for having me this week! Welcome to another week of Distress Ink madness here at Z². I’ve been on a total Distress Ink binge and this week I went all out with a bokeh inspired background for the Colour Me…! challenge. The challenge this week is to create a project using two tones of green: moss and emerald. My card incorporates two colours of Distress Ink and three different homemade stencils to achieve my bokeh inspired background. Once I finished my background, I heat embossed a subtle sentiment and cut the background into four sections before adhering it to my cardbase. Sharing is caring! I’m also going to play along with the Friday Mashup gals in their 200th challenge. I’m going to mashup #174, Bokeh, and #154, Spring Colours.